On August 1, Hikashu will be the same bill as Charan Po Rantan, a sister's duo, at La Mama in Shibuya, Tokyo. Since their debut, the popularity of Charanpo has been rising steadily - for example, they are to play at Aoyama Enkei Theatre (capacity 360) in two consacrating days of November. These two groups have some opportunities to play together in the past. 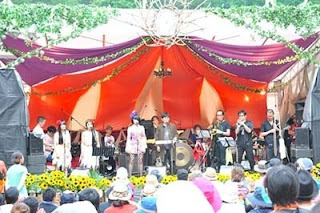 For instance, Charanpo have been choosen as guest artist for Hikashu's annual year's end concert for three times straight. At last year's concert, they did their own set, and singing with the Godzilla Legend ensemble which was augmented by Hikashu members and all women's horn section, led by the founder Inoue Makoto. The final number of the main set was Inoue's magnum opus, "Nihon No Egao" (The Smiles of Japan) with the chorus by the Charanpo sisters, and that turned out to be truly splendid. Anyway, this is a must-see gig, and the demand for ticket looks surely high, so secure yours early. 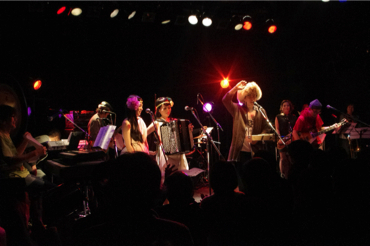 The ticket is available now at La Mama and Lawson Ticket. "Hikashu and Charan Po Rantan"